Recently I joined a couple of Facebook blog groups, and it has been so much fun. That of course got me thinking about the places that allowed me to find those groups, and how it would be great to share since I know a lot of my blogger readers out there love to connect! If you’re on a mission to connect with bloggers, start at SITS Girls. It doesn’t matter if you’re a guy or girl blogger, there’s hundreds of bloggers (thousands probably) who visit that site daily, and there are so many opportunities to publish your posts, get featured, link up your posts, get sponsor opportunities, and Twitter chat with it’s ridiculous. Every week day, SITS features one new blogger. They call it your ‘SITS Day’ when that blogger is you. It’s so wonderful because everyone who wants to be featured on SITS in the future has to comment on the day’s featured blogger every single week day, so not only do you get a ton of comments on the post that features you, but you get to list a few of your own blog posts that these bloggers also have to comment on. Pro tip: Every time you check out the blogger of the day, add them to your Bloglovin’ feed if you find them particularly awesome. (More on Bloglovin below). Once you’ve added them to your Bloglovin’ feed, each day you’ll see any new blog post they publish. Visit their blogs weekly and leave friendly, thoughtful comments. The more comments you leave, and the more time you spend on their blog, the better your chances of connecting and collaborating together with them on something cool in the future! It was through connecting with all of these different bloggers on SITS that I was even able to find a blog that holds a blogger book club each month, and it’s been a blast chatting about it in the Facebook group. If you’re interested, check it out! Blogelina is a website dedicated to blogging, and it’s terrific. It probably got me the most traffic ever in my life through their March commentathon. Not only does it have really great blog posts on how to drive blog traffic, but the site is awesome at connecting you with other bloggers. First, there was a commentathon I participated in recently there, where you were assigned to a group of 50 blogs you had to comment on, and all of those other 50 bloggers had to comment on yours. Secondly, they have blogger buddy groups where they connect you with 15 or so bloggers in a private group on Facebook, so you can make blog friends and support each other! I can’t sing this site’s praises enough, and I thank my good blogging friend Lauren Tharp for introducing me to it! Bloglovin is like Feedly, but for blogs. You follow all sorts of blogs, and every time one of those bloggers publishes a new blog post, you see it in your home feed. Once you click on it, it takes you to the blog post, but at the top of the page there is a little Bloglovin’ title bar that appears, where you can save the post you’re reading, share it, or move on to the next blog, without having to go back to the home feed. It’s pure magic because you don’t even have to know any blogs to get started. When you sign up, you can browse all of the blogs listed, and see which ones you want to follow. Keeping all of these blogs organized into a feed makes it much easier to visit and comment on all of your favorite blogs, without having to remember them or find them on your bookmarked pages. I follow about 35 or so blogs right now, and whenever I’m in the mood to go on a commenting/connecting spree, I just go there, sign in, and read, read, read. Also, if other people follow you, they see your new posts as you publish them, which gets you more traffic. Through Bloglovin I have found so many link-ups to participate in, it’s like making new friends without ever leaving your house. Pure magic I tell ya. 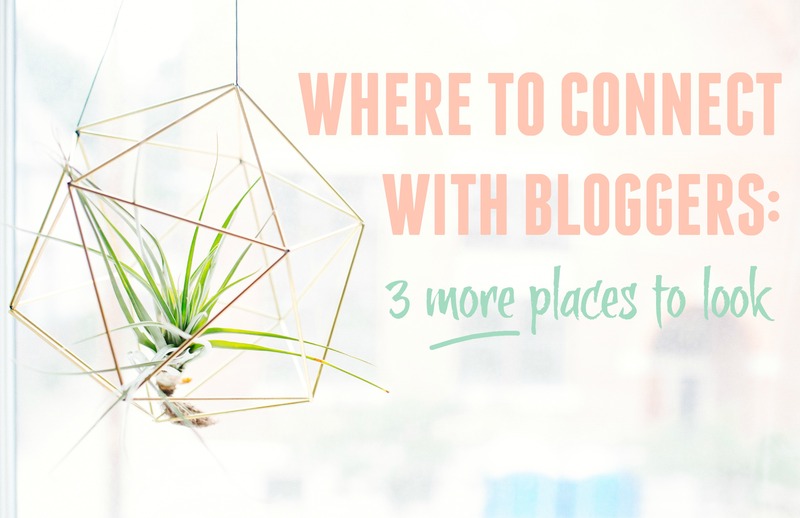 Where do you connect with bloggers? I know there are a dozen or so more places, I just haven’t tried them yet, so if you know of any, do share the love below! SITS is definitely a great resource I’m not having the same luck with the Blogelina group. Mine isn’t active heh. Oh no what a bummer! I think you can contact Blogelina if your group isn’t very active, and they will assign you to another. It’s so awesome when you have a group that’s active, it’s worth the inquiry! Thanks for stopping by Julie!